London Olympic bronze medallist Saina Nehwal on Monday pulled out of the $350,000 Singapore Superseries to spend more time in training to improve her game ahead of the hectic international circuit. Rio Olympic silver medallist PV Sindhu, meanwhile, will look to put behind her disappointing first-round exit at Malaysia when she leads the Indian challenge. The 27-year-old Saina said she will next play at the Asian Badminton Championship to be held at Wuhan, China later this month. "Yes, I withdrew from the tournament as I feel I need some more time training to get better. There is improvement in my knee but I think some more training will help at this point," Saina told PTI. "I will play Asia Badminton Championship next. I will also play the Indonesia Superseries and the Sudirman Cup," said the 2010 Commonwealth Games champion. Saina, who had won the Malaysia Masters Grand Prix Gold in January after recovering from a career-threatening knee injury, had bowed out of the opening round at Malaysia Open last week after losing narrowly to Japan's Akane Yamaguchi. While Saina will be missing in action, Sindhu, who clinched her maiden India Open at New Delhi to achieve a career-best World No 2 ranking, will have to get over the heart-break at Kuching, where she was stunned by upcoming Chinese shuttler Chen Yufei. However, a tough draw awaits Sindhu as she is slated to face Japan's Nozomi Okuhara, 2016 All England Open champion and Rio Olympic bronze medallist. Meanwhile, national champion Rituparna Das made into the main draw of women's singles and she will take on Chinese Taipei's Hsu Ya Ching. In men's singles, India's B Sai Praneeth will meet Denmark's Emil Holst after his compatriot Jan Jorgensen pulled out of the event. Rising star Sameer Verma will once again face Hong Kong's Hu Yun, whom he had beaten at the India Open earlier this month. Ajay Jayaram, who had beaten World No. 2 Viktor Axelsen en route to the quarterfinals at Malaysia Open last week, will meet fifth seeded young Chinese shuttler Shi Yuqi, who had reached the finals at the All England last month. 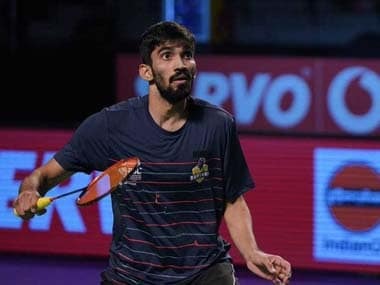 After skipping the Malaysia Open following his second- round loss in India Open, Kidambi Srikanth will be looking to regain his form that saw him conquer the 2014 China Open and 2015 India Open. The former World No 4 will square off against a qualifier. In men's doubles, Manu Attri and B Sumeeth Reddy, who have found the going tough ever since their Olympic qualification, will face Japanese third seeded pair of Takeshi Kamura and Keigo Sonoda in the opening round. Syed Modi Grand Prix Gold finalists, Ashwini Ponnappa and N Sikki Reddy will meet Malaysian combo of Yin Loo Lim and Yap Cheng Wen in women's doubles competition.